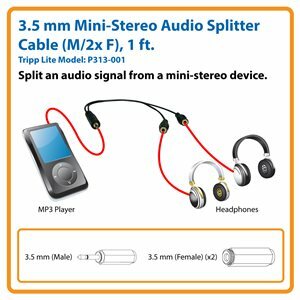 Tripp Lite's 3.5mm Stereo Splitter Cable splits the audio signal from your computer to multiple speakers or, allows connection of two headphones to a single iPod, MP3 player or any audio device utilizing the 3.5mm stereo jack. Fully molded connectors ensure long life usability. 3.5 mm Mini-Stereo Audio Splitter Cable, Black (M/2x F), 1 ft.
Split an audio signal for use with multiple devices that are equipped with standard portable headphone jacks. Tripp Lite’s P313-001 features a 3.5 mm male connector on one end that fits most portable audio devices (including iPods, iPhones, iPads and MP3 players) and two 3.5 mm female connectors on the other end for connection to speaker or headphone audio cables. Insert the male connector into the audio source, and connect your device audio cables to the female connectors. Manufactured using only top-quality materials, the P313-001 has gold-plated connectors to ensure excellent conductivity with minimal signal loss and optimal clarity. Molded construction with strain relief offers durability and long life. The cable and connectors are black. The P313-001 comes with a lifetime warranty. It’s manufactured in compliance with strict RoHS specifications, reflecting Tripp Lite’s commitment to environmental responsibility.